Non runners in horse racing: what are they? If so, it’s not necessarily something to worry about. You haven’t been cheated out of any winnings. Instead, it’s likely to be due to the withdrawal of a horse (or horses) from a race, after the bookmaker’s books had already been “priced up”. In this post, I’ll explain what non runners are in simple terms and how they might affect your bets. What is a non runner? In horse racing, a non-runner is a horse that was supposed to run, but didn’t. It’s as simple as that. This withdrawal can take place any time: in the days before the races or at a much later stage – like between the Final Declaration and the Off. The Final Declaration is when the racecard is formed and all the horses intending to run in are announced. This usually happens around 48 hours before the race. The Off is the start of the race. What’s the difference between a non runner and a withdrawal? Not much, but if you want to be pedantic, there’s a small difference. And it’s due to timing. Usually, a non runner is known in advance. A withdrawn horse is one which is taken out of the race much later. Although there’s a slight difference in terminology at the time, a withdrawal will ultimately become a non runner once the race is over. The horse was declared in the racecard but with a side note of ‘doubtful’ from its trainer. This could one being that they’re not sure if the condition of the ground is going to suit the horse, e.g. heavy rain forecast, or too dry. On the day of the race a trainer can pull a horse out of the race for whatever reason. It could be that the horse has gone lame or didn’t travel to the race meeting very well and in the trainer’s opinion is no longer fit to run. The horse may also have bolted and/or thrown its jockey off with no time to catch it or get a replacement jockey, if needed. A horse can become ‘Not eligible to run’. Say it’s been entered in two races over a 2-3 day period. If it wins the first and the second is a Maiden race, it will no longer be able to run in the second race. A horse can only enter Maiden races if it hasn’t previously won a race. A single bet: If your chosen horse is the non-runner then your stake at the bookmaker will be refunded to you and the bet voided. No loss, no gain! An accumulator bet: That leg of your accumulator will become void. It will be removed from the multiple and your accumulator odds (the price you got) will be reduced accordingly. Sadly, the expected pay-out, should the other legs of your bet win, will be smaller than you were expecting because you’re accumulating winnings over less events. Though it isn’t always the case, it’s very possible that your bet will be affected by a different horse being withdrawn. I’ll try and see if I can cover why re-pricing or even changing the odds of your existing bets needs to be done – without going too deeply into the maths! Ok, so when a horse is withdrawn from a race, the bookmaker has to re-price his book. The make up (or ’tissue’, as it’s known) of odds and prices are such that a bookmaker covers 100% of the horse race plus a wee bit for his margin (his commission if you like). Let’s pretend we have a very generous bookmaker who doesn’t take commission and an eight runner race where all of the horses are equal. They would all be priced at odds of 8.00 (or 7/1) as they would each have a 1 in 8 chance of winning. That’s the bookmaker’s book balanced – he has the race covered. However, if one of those horses gets withdrawn, there are only 7 horses left in the race. Presuming they all still have the same equal chance of winning, that chance is now 1 in 7. In this case, the bookie must reduce the odds to 6/1 or 7.00 to keep his book square. A reduction in price isn’t always as easy as the above example because runners aren’t all evenly priced to start with. However, it hopefully explains why a reduction in the odds even has to occur. What the bookie actually does is apply a Reduction Factor to avoid doing complex calculations every time. The Reduction Factor (also called a Rule 4 Reduction) is decided based on the price of the withdrawn horse. OddsMonkey Premium members can check out this guide for more information. They can also use our handy calculator to recalculate bets if needed. Why is it called a ‘Rule 4’ reduction? Originally, there were a specific set of rules on horse racing that bookmakers had to follow. These were known as “Tatersall’s Rules of Racing” and the particular rule that covered suggested price reduction bands was number 4 on the list. They took the Ronseal approach on that one. Could a non runner affect my each way bets? The picture above comes from OddsMonkey’s Guide to Each Way Betting (available to Premium members) which goes into more details about place terms. Let’s look at another example of the effect non runners might have on an each way bet. For this, we’ll go back to the 8 horse race from ealier. If you’d bet on one of those horses each way, you likely expect to have covered the top 3 places. However, as you can see from the picture above, after the non runner, the race reduces to 7 runners and the bookmakers will then only pay out for 1st and 2nd. They do change the terms usually too, so it all works out fairly fair. Just in case you’re wondering why if your horse comes 3rd you’re missing out on a payout. This will only happen in very specific cases, as it’s related to the number of runners in a race. But it’s definitely something to be aware of. That’s a basic introduction to non runners in horse racing and how a withdrawal might affect your bets. Become an OddsMonkey Premium member and get access to the guides mentioned above and so much more! If you have a maths or Matched Betting question, Peter is your man! An ex-maths & P.E. 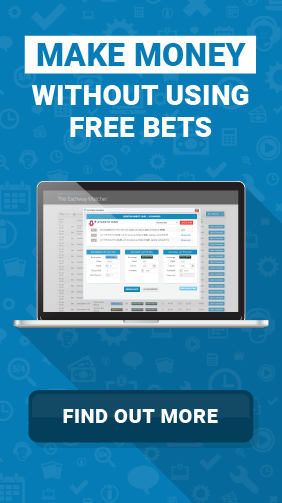 teacher, Peter has been matched betting for over 10 years.